This is a recent painting inspired by a sculpture found in Pfarrgemeinde St. Cäcilia (a church in Heusenstamm, Germany). I visited the area during my trip to Germany for my two person exhibition with my mentor Mel Ramos (“Mel Ramos and Gabriel Navar – Mentor & Mentee”) in Galerie B. Haasner in Wiesbaden, Germany. The initial interest in creating this painting was the challenge and compositional fun engaged in the exercise of foreshortening the figure for visually dramatic, three-dimensional impact, which has always been of interest to me. 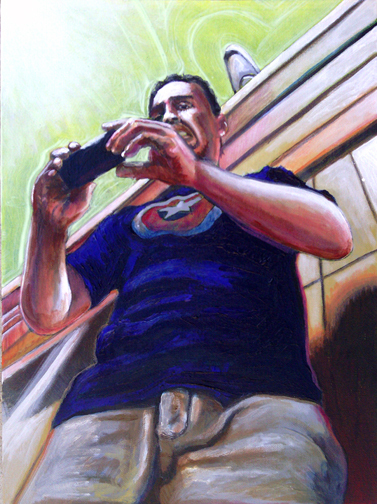 Furthermore, as with just about all of my paintings, color is important, especially complementary-pair combinations (here, I juxtapose the rich blues of the Captain America t-shirt amongst washes and glazes of “sun-caused” yellow, yellow-orange, pinks and salmon notes both on the figure’s skin as well as on the structure behind him). My goal is to feature a painting three times per year, in April, August and December. Please read more at http://gabrielnavar.com/featured.htm.